Ubuntu GNOME Team is happy to announce the release of Ubuntu GNOME Trusty Tahr Beta 1. We’re preparing Ubuntu GNOME 14.04, the Trusty Tahr, for distribution in April 2014. With this early Beta 1 release, you can see what we are trying out in preparation for our next version. We have some interesting things happening, so read on for highlights and information. Please see Testing Ubuntu GNOME Wiki Page. Thank you for choosing and testing Ubuntu GNOME! It is the Beta 1 week for Trusty Tahr and now, we do need your help to test this build of Ubuntu GNOME Trusty Tahr urgently so that we could release the Beta 1. This is a call for testing for all testers of Ubuntu GNOME. Please, help as much as you can. If you have any question, please join Ubuntu GNOME QA Team and send your questions or feedback to the mailing list. Please understand that reporting bugs should not be on the mailing list but you do need to follow the correct procedure – please see this. As always, thank you for testing and your endless support! I’m glad to announce that Ubuntu GNOME Wiki & Documentation Team has finished all the assigned tasks for Trusty Tahr Cycle and starting from today until the final release of Ubuntu GNOME Trusty Tahr, The Wiki & Documentation Team will go through all the pages and try to polish and improve any page that needs any kind of improvement, if any. Wiki & Docs Roadmap for Trusty : Implemented successfully. Ubuntu GNOME HOWTOs : Implemented successfully. Accessibility Wiki Page : Implemented successfully. Installing Ubuntu GNOME Wiki Page : Implemented successfully. Very Important Wiki pages to be updated always – Please Note this is not a cycle specific blueprint, hence it is NOT part of any roadmap : Informational. I’d like to thank Ivan and James for everything – their excellent work, great support and high quality contributions. Thank you so much and keep the great work up! What seemed hard to achieve, was an easy mission and fun. That is the power of collaboration. If you have any feedback, suggestions, notes, etc … please feel free to Contact Us! See Also: Getting Involved with Ubuntu GNOME. 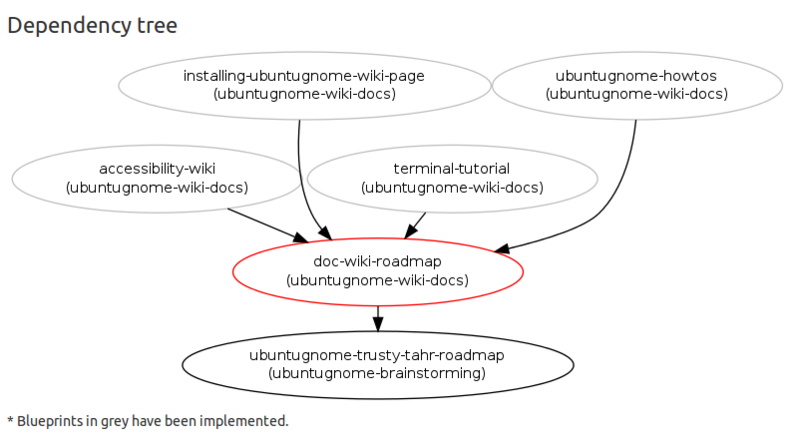 This is considered as ‘the wrap up report of Ubuntu GNOME Wiki & Docs Team for Trusty Tahr Cycle’ and most likely, we have no more reports to share unless there is something new. Part of our new plan to publish more news about Ubuntu GNOME Team and/or Sub-Teams reports; this week, we would like to share with all of you our weekly report for Ubuntu GNOME Artwork Team. Just a reminder, Ubuntu GNOME Marketing and Communications Team usually publish monthly reports. And, last week, Ubuntu GNOME Wiki and Documentation Team has published a weekly report for one of the most recent achievements or work done. 1. Update the logo on our Social Media Channels. 2. Finish the Wallpaper Contest submission period. 1. Select wallpaper contest winners. The process will be explained when everything is ready. 2. Review ubiquity slides. Now that we are approaching Beta 1 we are ready to move on and rethink the features we are promoting and how they are described. 3. StartUbuntu: we only need a nice description of Ubuntu GNOME to finish the flyers. “It may seem lots of work but we’ll make it without problem if we organise well. Report was sent to the Artwork Mailing List and the general mailing list. Thanks to Alfredo and his team for all the work done and we highly appreciate his honesty and for being open. This is the quality we always talked about. Be honest, direct and open and share everything about the project whether it is good or not. The mistakes that Alfredo has mentioned will be avoided with the next cycle because we have addressed these issues and we have learned from that. “As prep for the upcoming 14.04 LTS release of Ubuntu I spent some quality time with each of the main flavours that I track – Kubuntu, Ubuntu GNOME, Xubuntu, and Ubuntu with the default DE, Unity. And, if you have done that already, you still can test or even better do Bug Triage which is very important and needed. Let’s help each other and move forward in order to make Ubuntu GNOME one of the best Linux Distributions and YES, that can be easily achieved if we will work together. Thank you for testing Ubuntu GNOME! When Ubuntu GNOME Team started to grow bigger, it was necessary to start organizing the team in a way that could help everyone and make things better. The birth of Ubuntu GNOME Sub-Teams had announced and a new era had started. So many interested people applied and it was also necessary to organize everything and put everything on its right place. In order to make life easier, we have created a Wiki Page that should explain the full new structure of Ubuntu GNOME Community. In order to be considered as an official member of Ubuntu GNOME Team, there is certain list of requirements that you need to go through one by one and once done, there is another shorter list of steps you need to follow so that you will be considered as an official member and contributor to Ubuntu GNOME Team. As with every voluntary basis community or project, at sometime, there are so many interested people who would like to join (specially if there is something new or it is a new project) but fewer serious people will remain and actually contribute to that project or community. It was important to find an easy yet effective policy to control that in a very efficient way with the minimum efforts and with only few seconds involved. Here comes the 90-days-policy of Ubuntu GNOME Official Membership. And it was a matter of time until this policy of the 90 days has proved how effective, important and easy it is for everyone. You are an active contributor and member of Ubuntu GNOME > > > Once your membership is expired, you have the full control to renew your own membership of the sub-team you are part of. You are inactive member > > > Once your membership will be expired, you are no longer of the sub-team you were part of. Or You were busy or away – in this case, you can either renew or re-apply for membership of the sub-team you were part of and you are required to send an email to Ubuntu GNOME Team to explain what happened. 1- Take this page more seriously and to read all the sections carefully. 2- You need to contact the Team Leader/Driver of the Sub-Team you would like to re-join it. 3- To be approved for membership again you must make at least few contributions as a proof that you are serious this time. Only then, you can be approved again. Sorry for the long post but we hope this will be informative and helpful. You need to understand that each project and/or community has its own requirements. So, this is not new and can be found everywhere and anywhere. Every time there is something we would like to share about Wiki and Documentations of Ubuntu GNOME, we tend to always remind the world of the huge, excellent and great job that Ubuntu GNOME Wiki and Documentation Team had achieved in very short period of time (less than 6 months). We have the right to be so proud of ourselves and for what we have achieved. Out of nothing, we have everything now. Today, we are glad to announce and share with you one of our great achievements that should give the users of Ubuntu GNOME all the resources and help they do need or may need in order to use Ubuntu GNOME and enjoy it to the maximum. We highly believe that a good and a successful software project should have a strong, helpful and useful documentations and that is exactly what we do at Ubuntu GNOME Team. We simply work hard to make your life easier. Despite the fact we are few volunteers dedicated to this mission, we do believe in our skills and the quality we could offer. Today, we are proud to share our work with everyone around the world. Please share your feedback and send it to Ubuntu GNOME General Mailing List. You need to ‘subscribe’ first ‘before’ sending any email so our Mailing List Moderators don’t have to approve your email. We also suggest that you read this guide before joining to any mailing list for any Ubuntu Community. As always, please refer to the Contact Us Tab on the top of this page or simply visit this page. We highly appreciate and value your time and we would like to thank you in advance for your feedback. We are looking forward to read from you soon! Thank you for helping us to make Ubuntu GNOME better and better and thanks to everyone who put so much efforts into all this, specially Ivan Ivanov and James Vorderbruggen. I have enjoyed working with them. They are so smart and learning quickly, not to mention they do read my mind and know what I want sometimes before I say it. I’m so glad to work side by side with such gifted and talented high quality contributors. I have asked Ubuntu GNOME Team Members to give their vote for a new proposal that I think it will improve our experience and our users’ experience as well. Everyone voted so far has agreed and was so interested about this new proposal. I’d like to announce that, since no one has disagreed yet, Ubuntu GNOME Team is ready and will start this new idea to share our news with the world either as weekly reports from all Ubuntu GNOME Sub-Teams to be published on our website and our social media channels or just news/updates to be published on the same mentioned sites. Either way, stating from now, we shall share each and everything with everyone and we believe that this will make our system, our community and everyone’s experience as good as it gets. Looking forward for a bright future with more achievements and news to share. 1- Do not dream big. 3- Do not have a plan. What this has to do with Ubuntu GNOME? Simply, these lessons are what we believe in and working on every single day. In order to be the best, you need to learn how to do that. After you learn, you need to follow and do. You need to carry on with what you love to do and what you believe in. Don’t wait for success, it will come at the end. Why? because all of us are smarter than anyone of us and together, we shall achieve all our goals. Ubuntu GNOME believes in these lessons and we shall never give up our dream to be one of the best Linux Distributions on the world in everything. This is what Ubuntu GNOME Community has learned from Linus Torvalds. If you believe in these lessons too, don’t think twice, come and join one of the most interesting, amazing, great and rapidly growing community and your life will be totally different, no doubt about it. And, if you’re not interesting to join Ubuntu GNOME, that is fine but please, do share the above video as a tribute to Linus Torvalds for creating one of the most successful software in the history of computing, that is Linux.